I rarely get excited about famous tourist sights. Taj Mahal was nice for sure, but I wouldn’t agree with all the fuzz. Angkor Wat was also quite impressive, although I found Lonely Planet’s description of “simply staggering” sight that’s “matched by only a few selects spots on earth” a bit too much. But Uluru? Uluru was different. Finally my expectations were met. Uluru is still far away in this picture. Yes, it is that huge. The surface of Uluru looks more red when the sun shines on it. 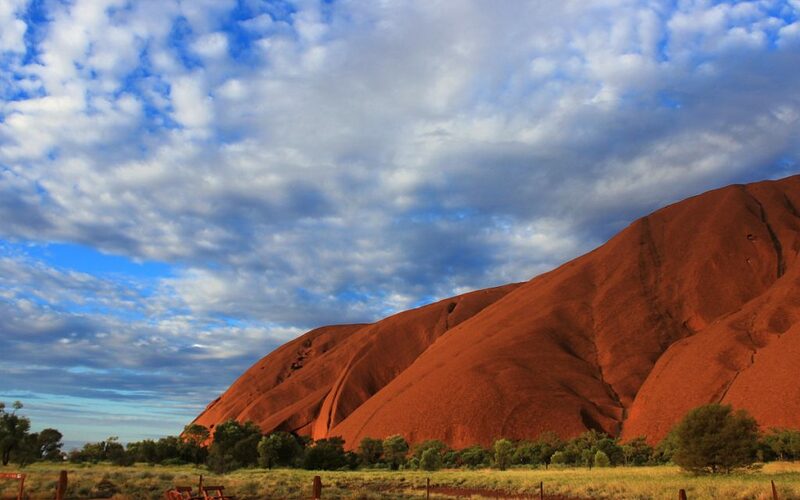 Uluru, also known as Ayers Rock, is perhaps the most iconic sight in Australia. (Yes, I’m blatantly ignoring Sydney Opera House, because Uluru is much more impressive.) The great sandstone rock formation rises from the middle of nowhere, surrounded by rough wilderness. The flat surroundings make the sight of the monolith all the more astonishing. 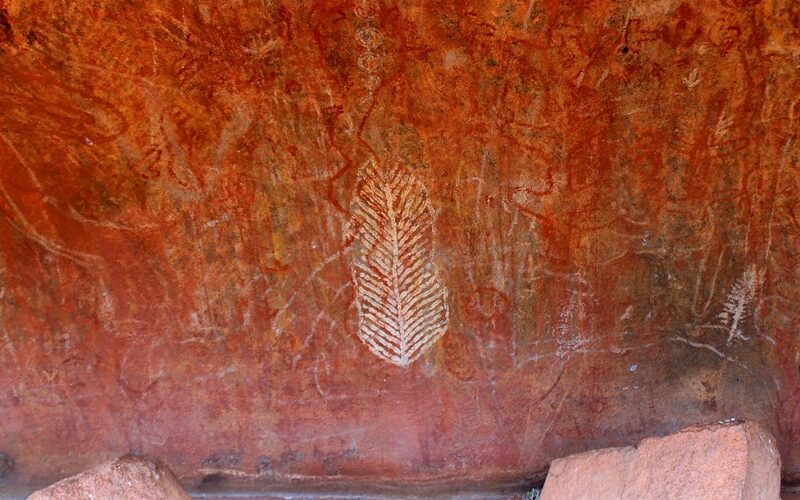 It’s easy to understand why the local Aboriginal people have considered the place sacred and supernatural. Uluru from 18 kilometers away. The whole monolith is 3.6 kilometers long and 2.4 kilometers wide, rising up to 348 meters. You need to be a few kilometers away to fit the whole thing in a single picture. One of the few public rock art sites at Uluru. Simply put, Uluru is beautiful. You can already see it from dozens of kilometers away, and it quickly captures your attention. From up close, Uluru becomes more varied interesting. I had always thought that Uluru has a quite regular shape and surface. After all, it just looks like a smooth bump in the photos – photos which are usually all taken from the same direction. 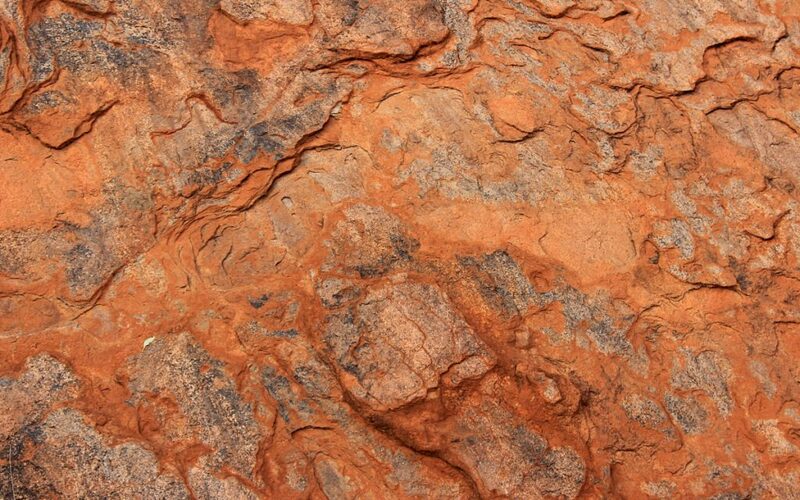 The surface of Uluru. It’s not as red and smooth as you’d think. Caves and vegetation are harder to spot from the distance. Still, Uluru is impressive in any sort of weather. Why should you visit Uluru before April 2018? 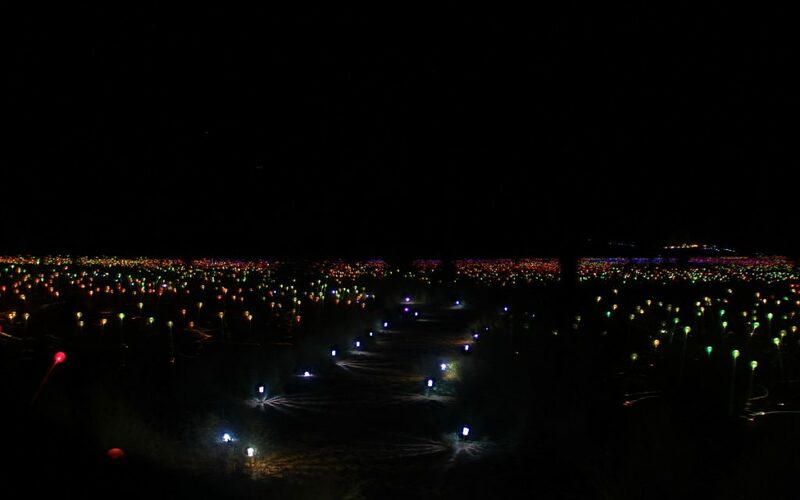 Because that’s when Field of Light, an art installation by Bruce Munro disappears from the area. 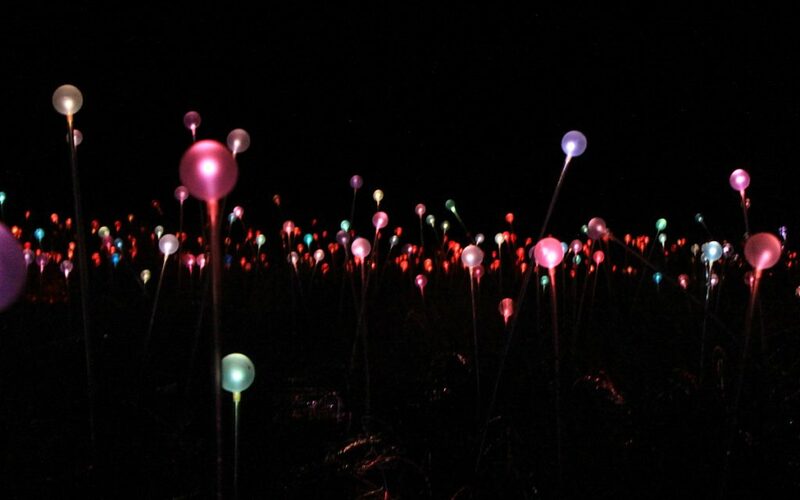 Field of Light consists of 50,000 lights on an area the size of seven football fields. Yes, the installation is just as magical as it sounds like. 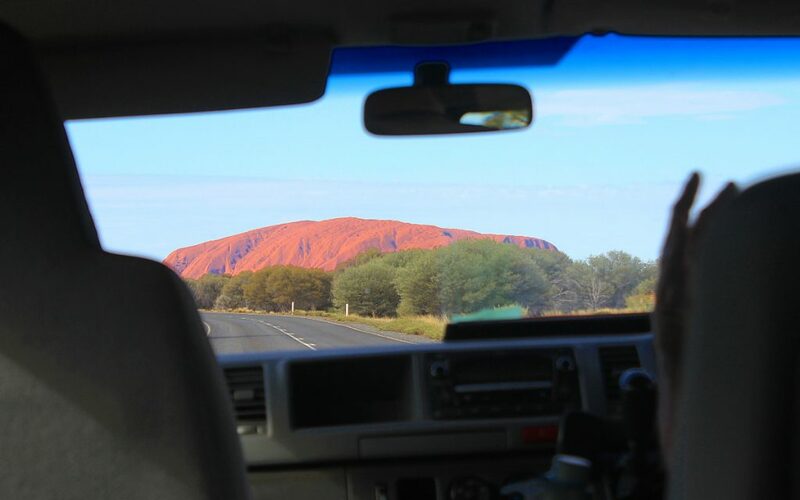 What’s There to Do Near Uluru? Most Uluru visitors stay in Ayers Rock Resort in Yulara, 20 kilometers away from Uluru. 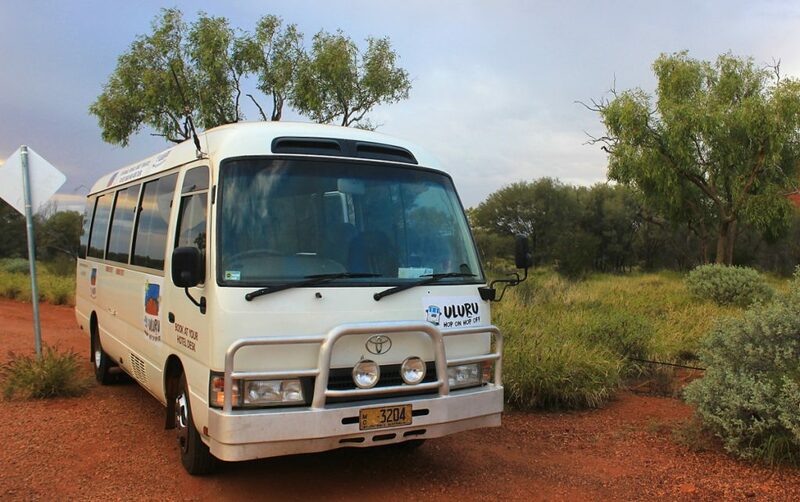 If you don’t book a tour or rent a car, Uluru Express offers Hop On Hop Off buses that almost work like a tour – there are only a few connections available every day, and the driver gives you information on the places you visit. 1 Day Pass costs 120 AU$ (79 €), two days 160 AU$ (119 €). Uluru Express falls somewhere between a regular bus ride and a guided tour. 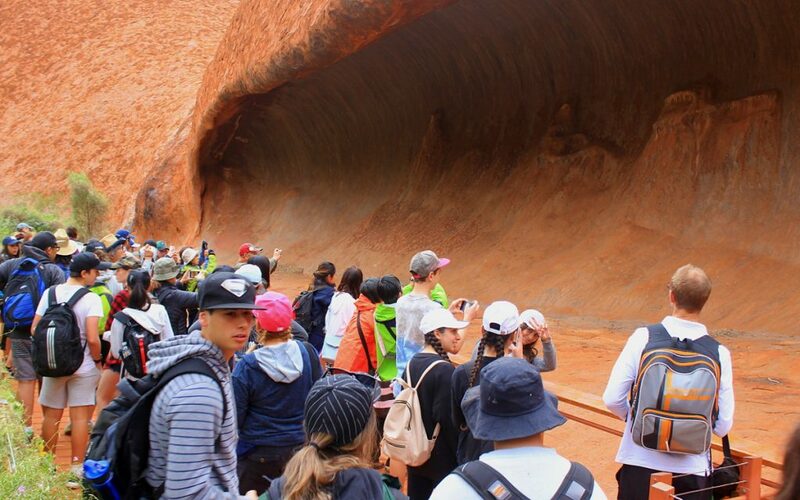 Uluru is not usually extremely crowded, but colliding with a school group might change the situation. Besides hiking paths, Ayers Rock Resort offers surprisingly many other activities. Or okay, maybe I’m just surprised because I don’t usually go to resorts as a budget traveler. There are exhibitions, talks and performances about local traditions and Aboriginal culture. The restaurants offer tasty food with local varieties, so if you’ve ever wondered what a kangaroo tastes like, here’s a chance to find out. As a science geek, I was delighted by the heavy presence of astronomy at the resort. Beside aboriginal culture, the place offers many astronomical activities, like documentaries and lectures. 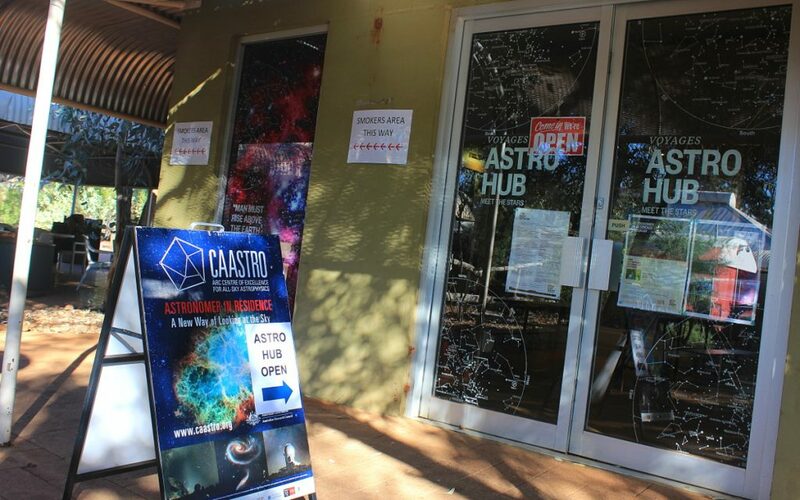 There’s even an Astro Hub where you can chat and ask about the cosmos every afternoon! An “astronomer in residence” serves on the Astro Hub every afternoon, ready to answer all your questions about life, the universe and everything. The slightly unexpected presence of astronomy services started from simple stargazing tours. The night sky in Central Australia can be very clear impressive, so they decided to offer activities centered on it. And then the supply just expanded from there. I tried to book the Astro Tour for my last night, but it was cancelled because of the cloudy weather. Kata Tjuta has several gorges between its peaks. View down from Valpa Gorge, Kata Tjuta. Uluru is located in Uluru-Kata Tjuta National Park. 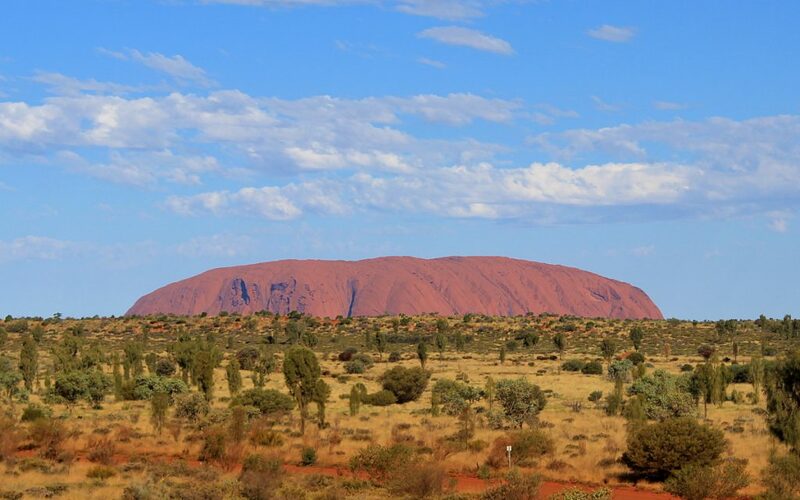 Uluru is Ayers Rock, but what’s the other half of the name? Well, that’s Kata Tjuta, also known as the Olgas. Another monolith 25 kilometers away from Uluru. Yep, you read that right. Uluru is not alone, although its sister is much less famous. Uluru and Kata Tjuta might be twins, but they’re definitely not identical. Kata Tjuta is Uluru shaped by Salvador Dali on LSD. Less picturesque (and much, much harder to fit into pictures), but still very impressive. 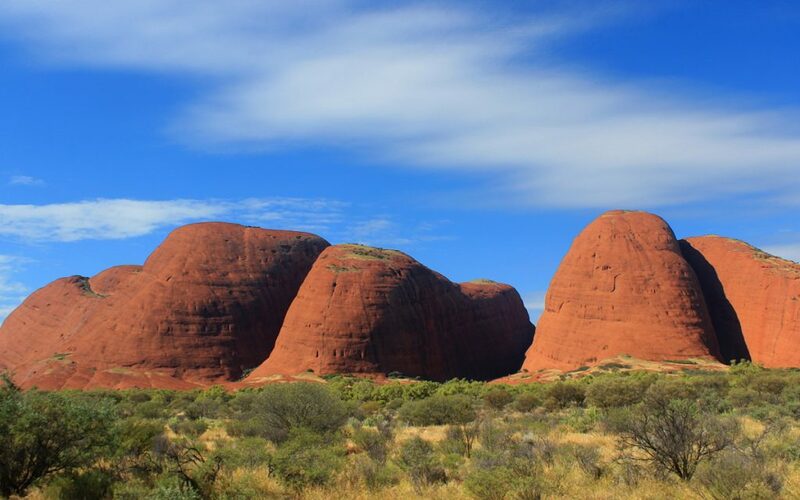 Kata Tjuta is a very otherworldly formation with soft curves and multiple peaks. Kata Tjuta offers a few hiking routes through the area. I only had time for 1 hour Walpa Gorge walk because I wanted to return to Uluru for sunset. I stayed in Ayers Rock Resort only for two nights, so I did most of my hiking during my one full day. 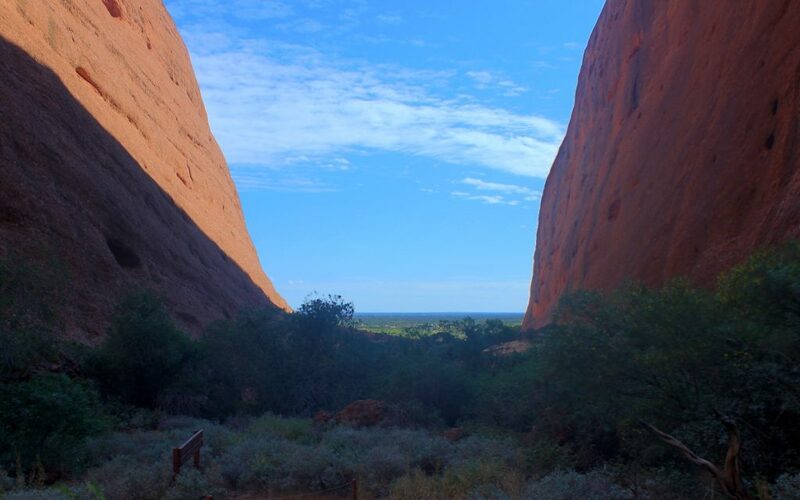 Had I stayed a night longer, I would have definitely tried the 4 hour Valley of the Winds trek at Kata Tjuta. 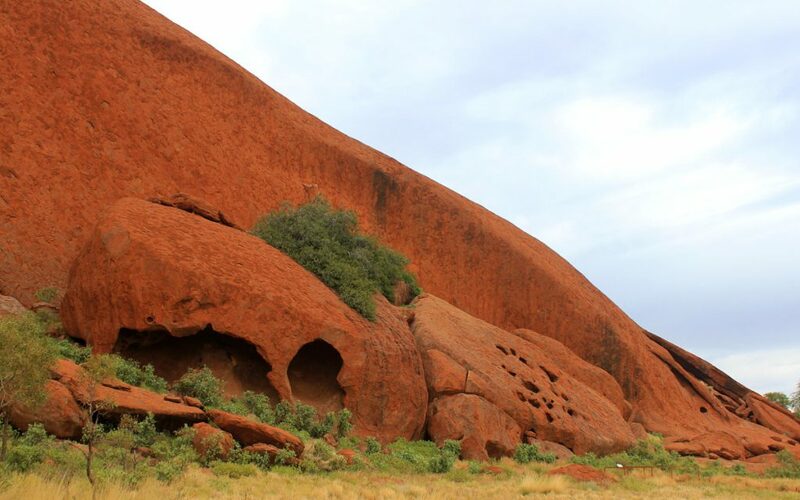 Although climbing Uluru is still allowed, it’s offending towards the local Aboriginal people. Please don’t do it. 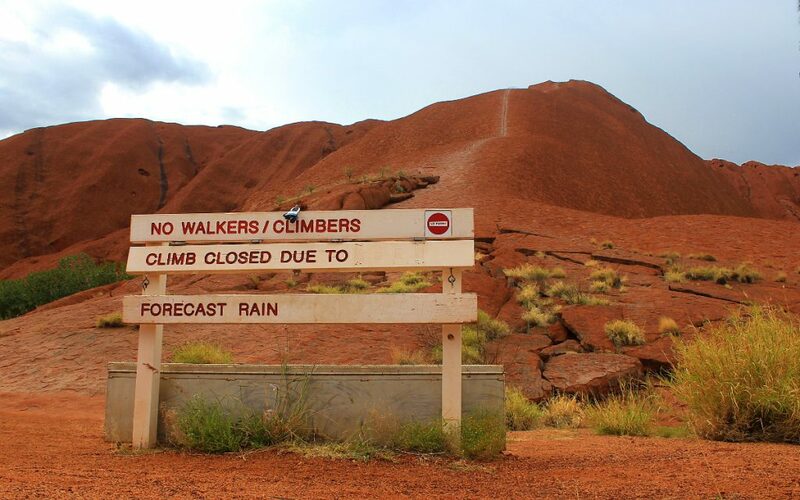 The path on top of Uluru will be closed when less than 20 percent of visitors climb it. A park guide estimated that this would happen in 2020. 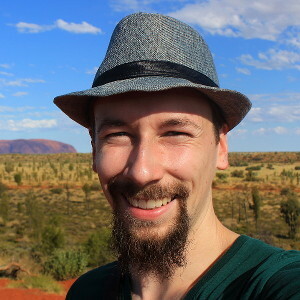 I didn’t originally plan to visit Uluru. I thought that it would be too expensive and too remote. Luckily, my Australian friend Kate (thank you Kate!) strongly recommended me to visit the place if I had the chance. Finally I obliged, realizing I’d never have a better chance to see it. I’m glad I did. 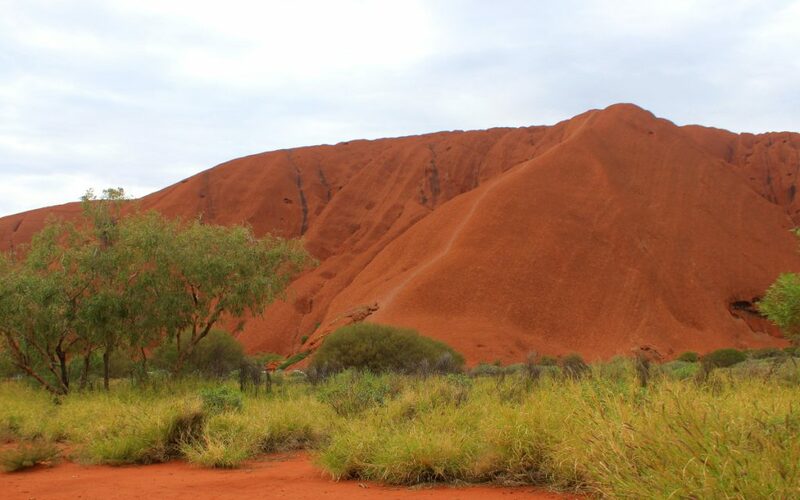 Uluru is quite expensive for a budget traveler, but the situation isn’t as bad as I first thought. If you check for accommodation at Booking.com, you’ll only find expensive rooms at the resort. That’s because the resort doesn’t list the Uluru hostel dorms of Outback Pioneer Lodge on the site. The restaurants of the resort are a bit expensive, but the resort also has a supermarket with praiseworthy fair prices. You can therefore prepare your own meals at the hostel kitchen if you want. 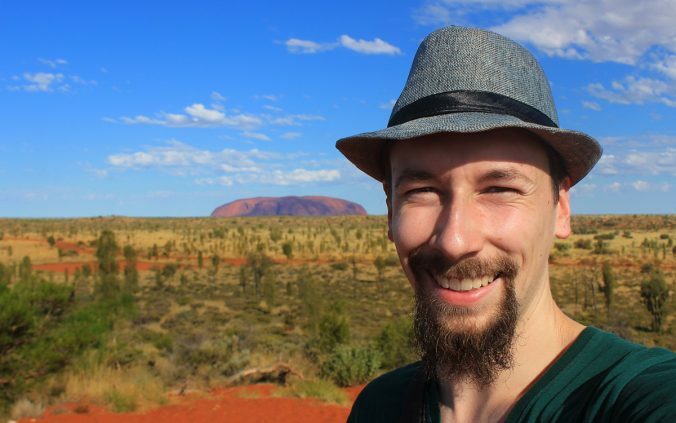 So, is Uluru worth a visit? Even if you wouldn’t get a beautiful sunrise, Uluru would still be worth it. Have you got any favourite destinations around the world? I’d love to hear your top choices in the comments below!